veg kadai recipe | kadai vegetable recipe | vegetable kadai sabzi with detailed photo and video recipe. simple and spicy flavoured sabzi recipe made with choice of veggies & kadai masala. 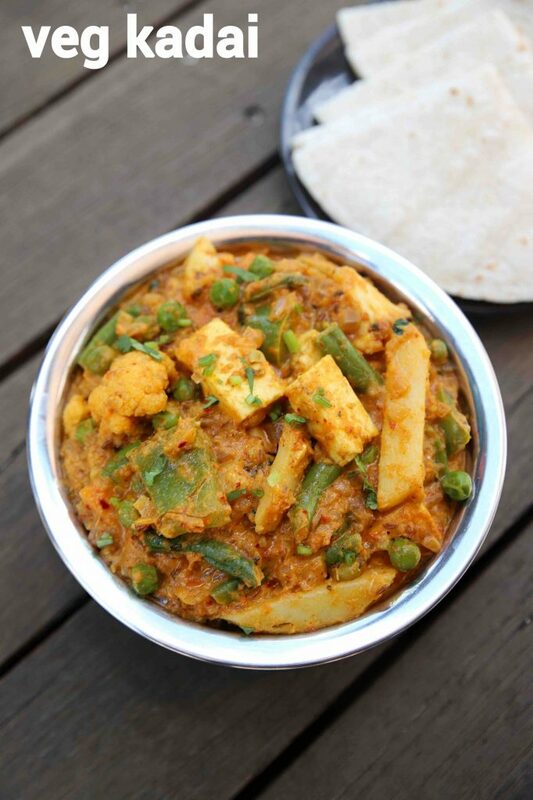 basically, an extension to the popular kadai paneer recipe, and made with mixed vegetables and same kadai masala. it is easy and simple to make and tastes great with roti or chapati for lunch and dinner. veg kadai recipe | kadai vegetable recipe | vegetable kadai sabzi with step by step photo and video recipe. north indian cuisine or punjabi cuisine is known for its rich and creamy sabzi recipes. typically in vegetarian, it is either made with paneer or deep fried kofta in cream based gravy. but this recipe of veg kadai, inherits the recipe from paneer kadai with same spice masala but with mixed vegetables. 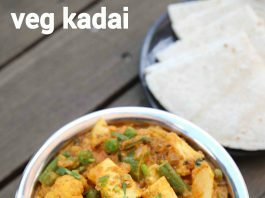 as mentioned previously, this recipe is an extension to the well known kadai recipe made with paneer. as such there isn’t any notable difference between these 2 recipes. but i personally like this recipe as you have more solid food instead of just spiced gravy. 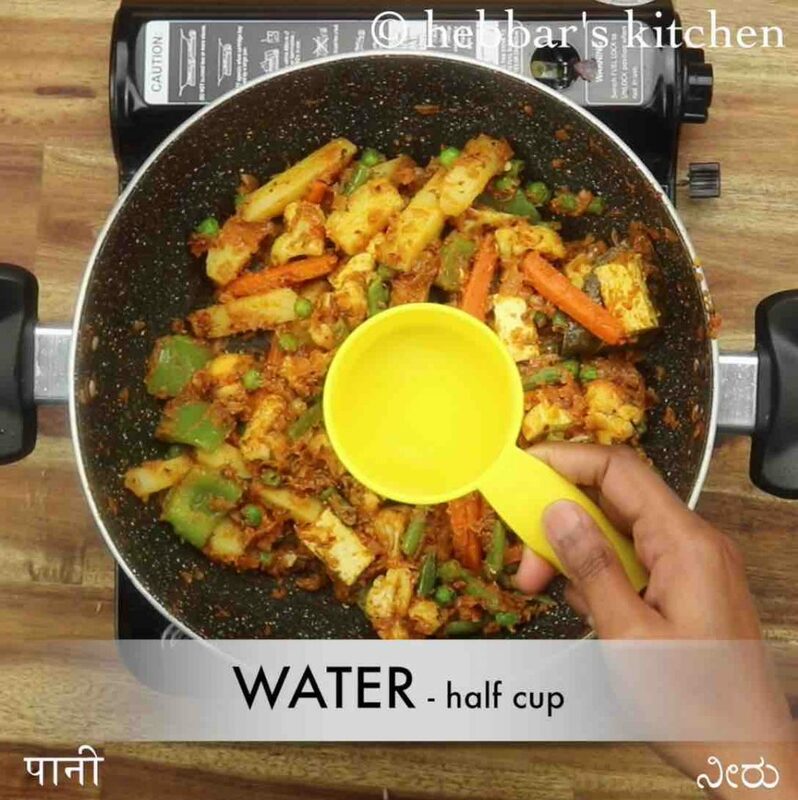 in the paneer based recipe, you may feel more of spices with less number of cubes. moreover, even in this recipe i have added paneer cubes with other veggies and hence this recipe can be termed as veggie paneer kadai recipe too. but at the same time it is completely optional and can be added if you have some spare or you like it. furthermore, some easy and important tips and suggestions to make a flavourful veg kadai recipe. firstly, in this recipe i have shown how to make kadai masala which is later added to the sabzi. you can make these spice masala well ahead in advance and can use it as required. 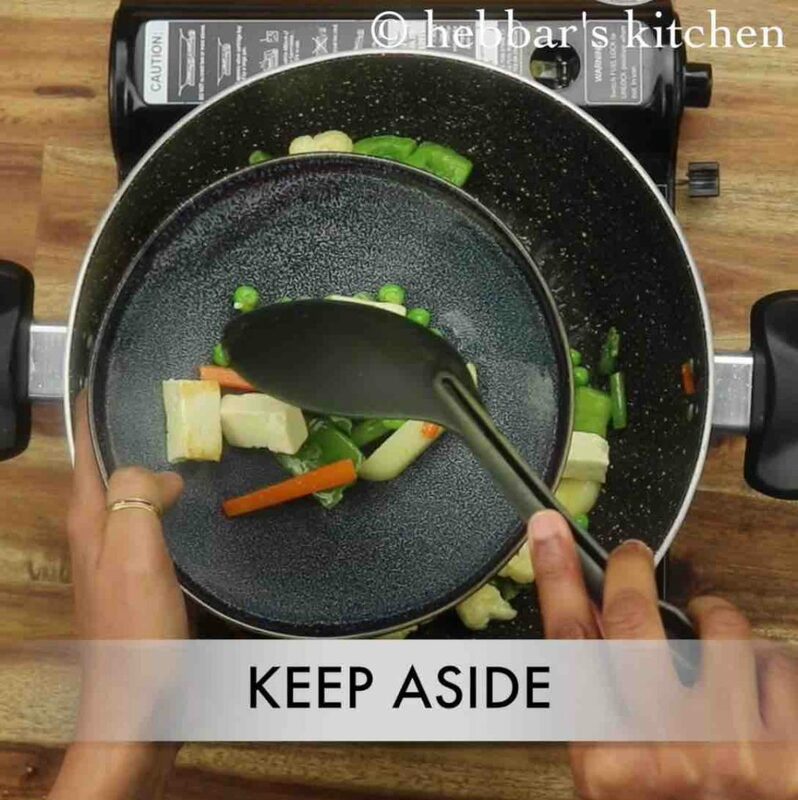 secondly, do not over cook the chopped vegetables as it should not loose its shape and crispiness. basically it must be cooked in a high flame so that it retains its crispiness. lastly, you can mix and match the recipe and make single vegetable based kadai recipe. 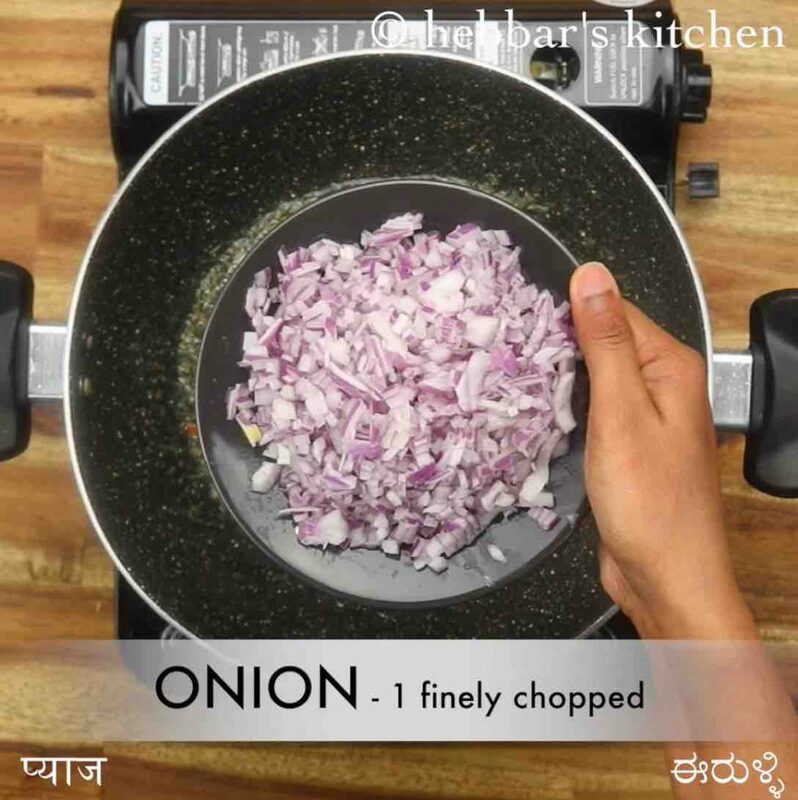 for example, you can make aloo kadai, mushroom kadai or baingan kadai recipe. 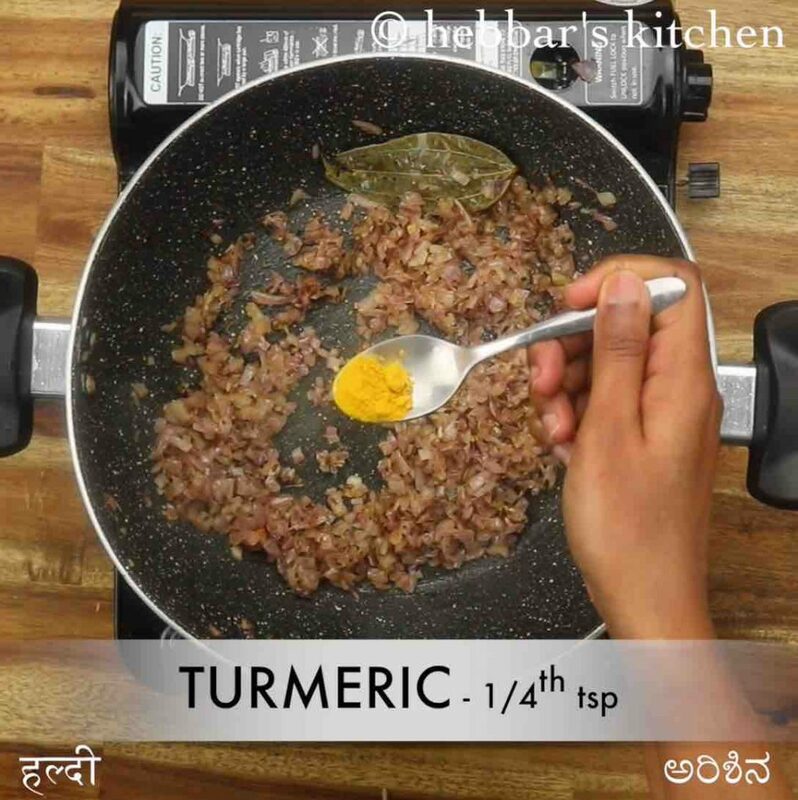 heat 1 tsp butter and saute 1 bay leaf, 1 tsp kasuri methi and 1 tsp cumin until the spices turn aromatic. further, add 1 onion followed by 1 tsp ginger garlic paste and saute until onions turn golden brown. keeping the flame on low add ¼ tsp turmeric and ½ tsp chilli powder. saute well. now add 1 cup tomato puree and saute well. 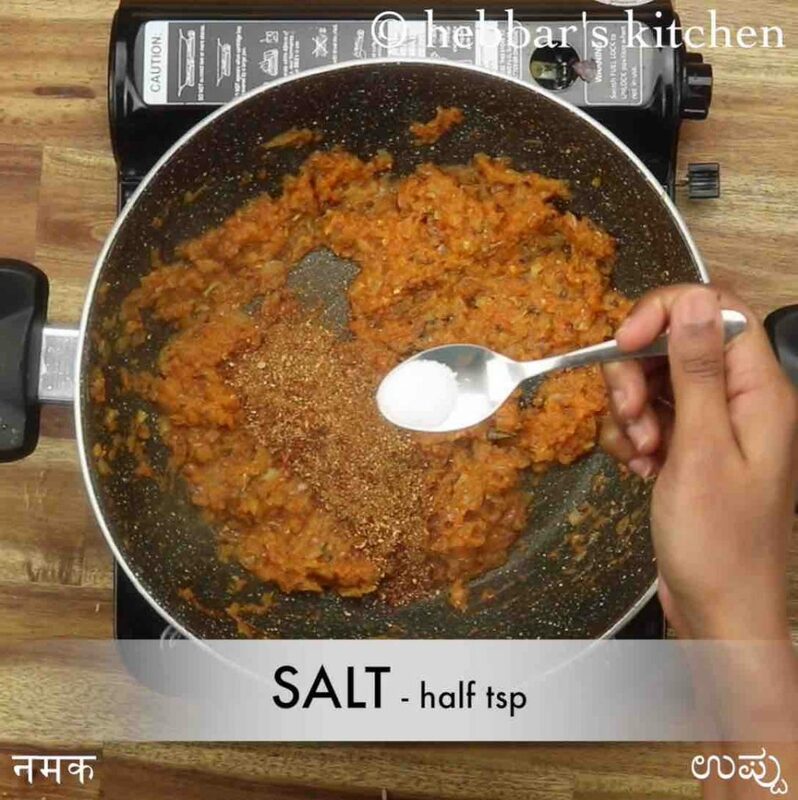 add prepared kadai masala and ½ tsp salt. add in roasted vegetables and mix well. also, add ½ cup water or more adjusting consistency as required. 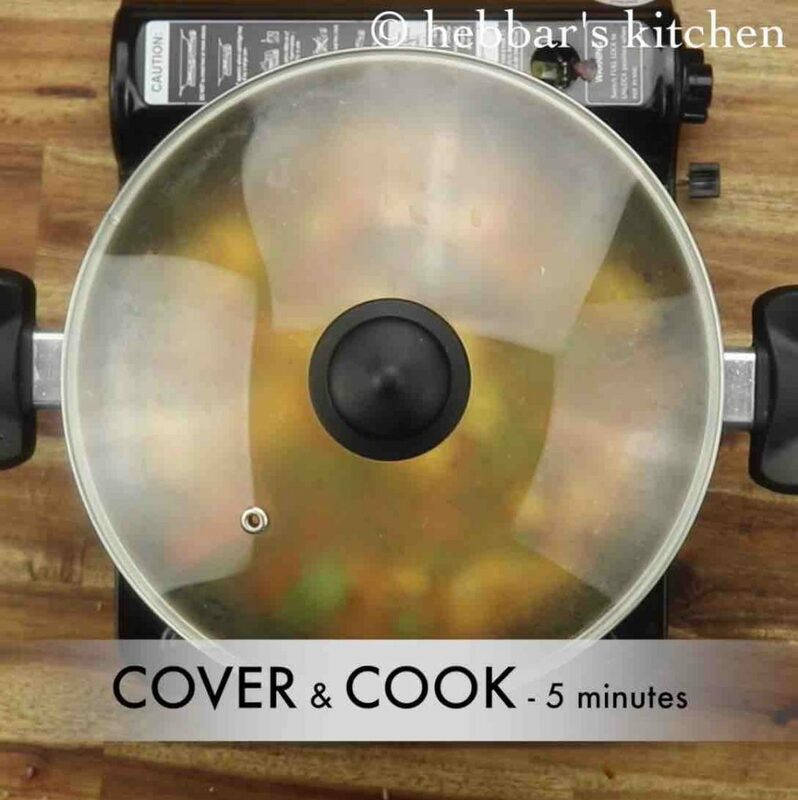 now cover and cook for 5 minutes or until vegetables are cooked completely. 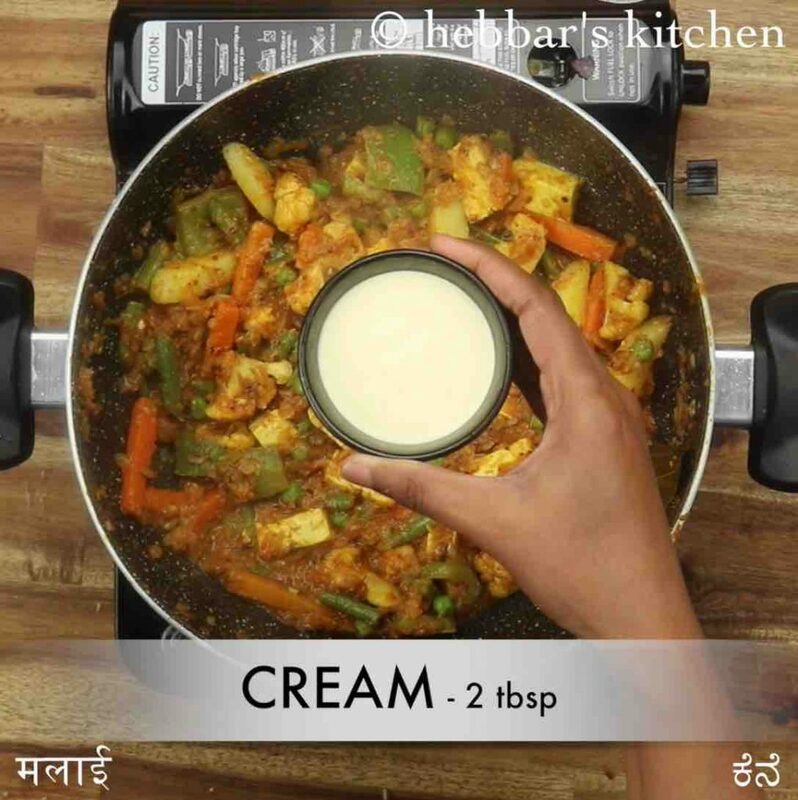 furthermore add 2 tbsp cream, 2 tbsp coriander and ¼ tsp garam masala. mix well. 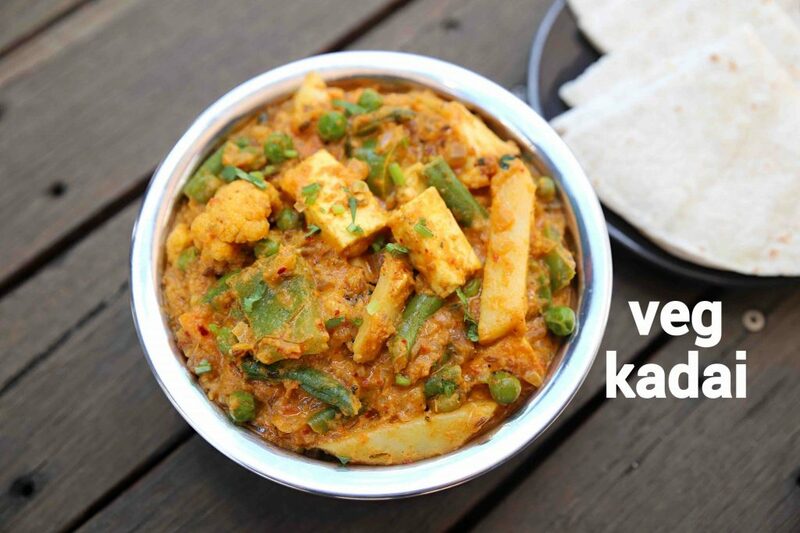 finally, enjoy veg kadai with roti or naan. 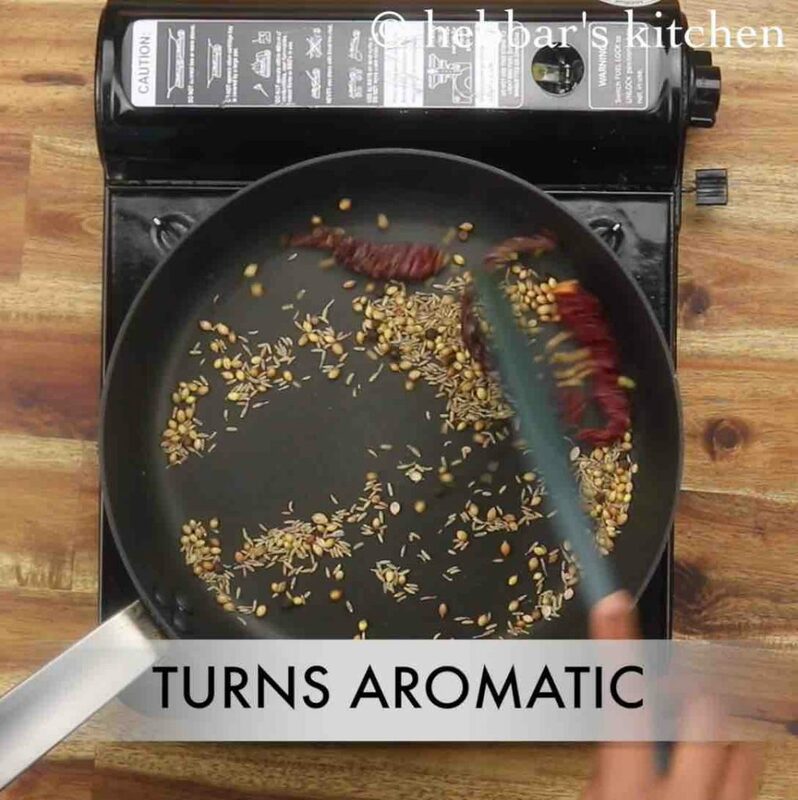 firstly, prepare the kadai masala by roasting 2 tsp coriander seeds, 1 tsp cumin, ½ tsp pepper and 3 dried red chilli. roast until the spices turn aromatic. 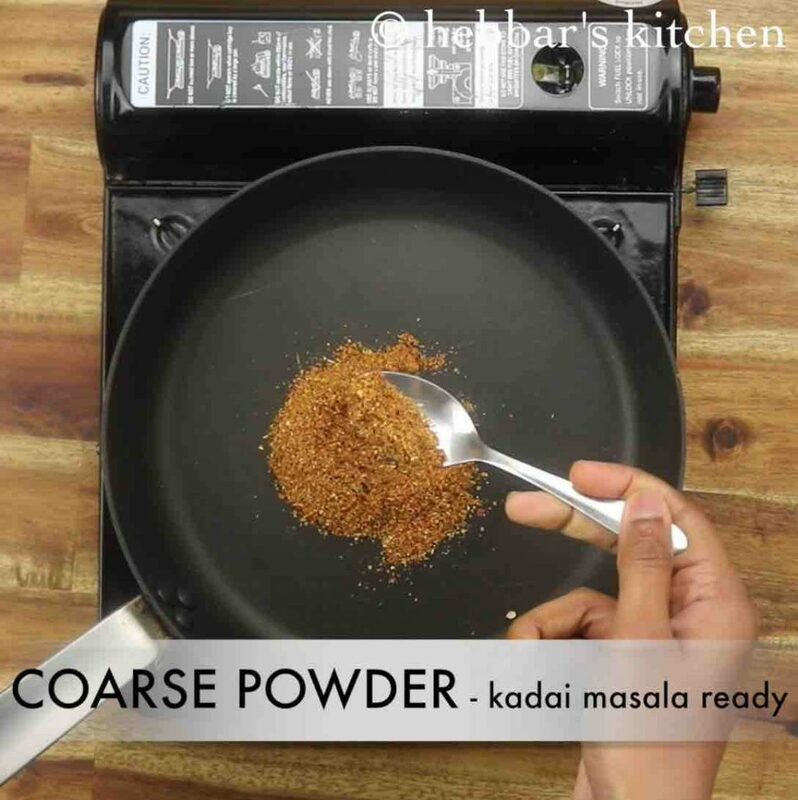 now blend to a coarse powder and kadai masala is ready. keep aside. 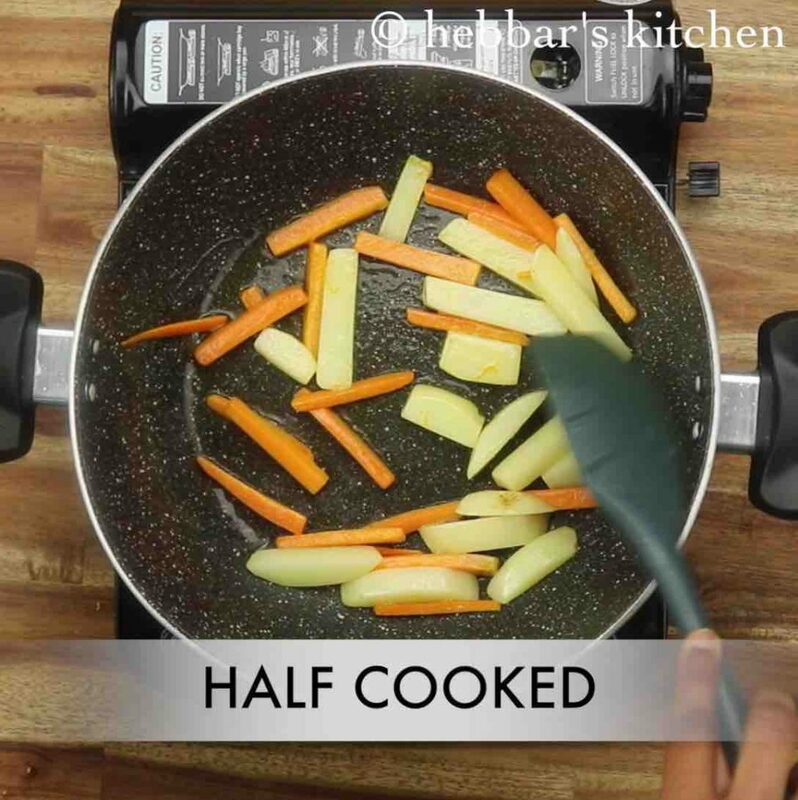 further in a large kadai heat 3 tsp oil and roast 1 potato and 1 carrot for 3 minutes. 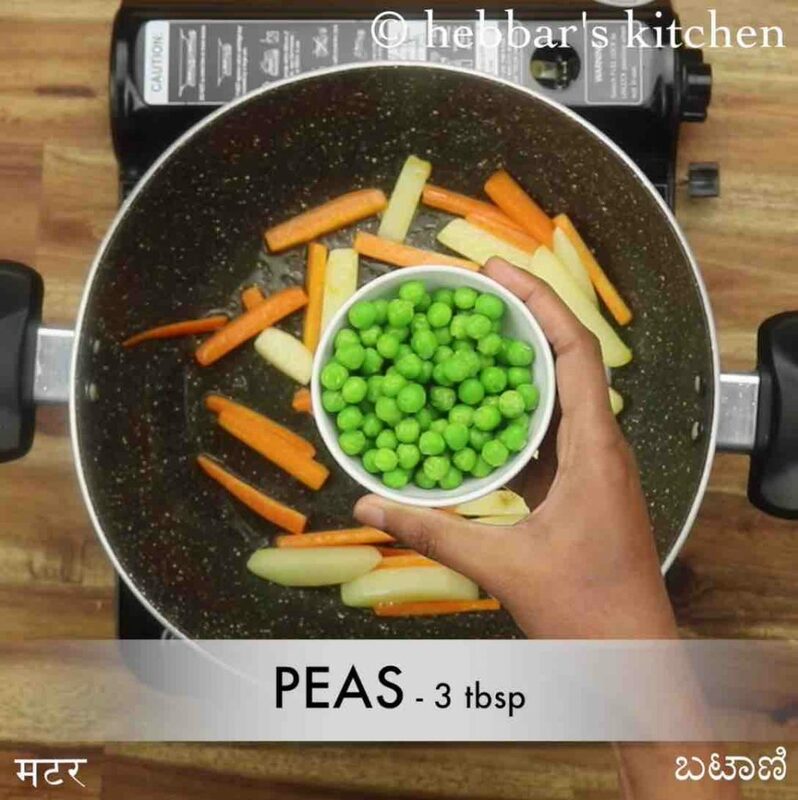 additionally, add 3 tbsp peas, 15 florets cauliflower, 5 beans, 10 cubes capsicum and ½ tsp salt. 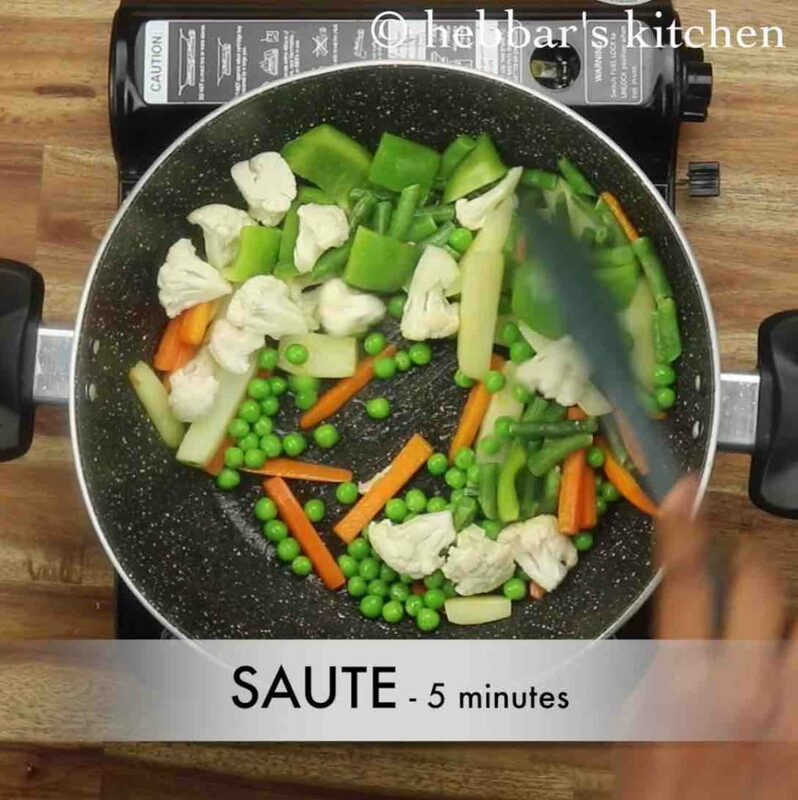 saute until the vegetables are cooked well yet retain their shape. 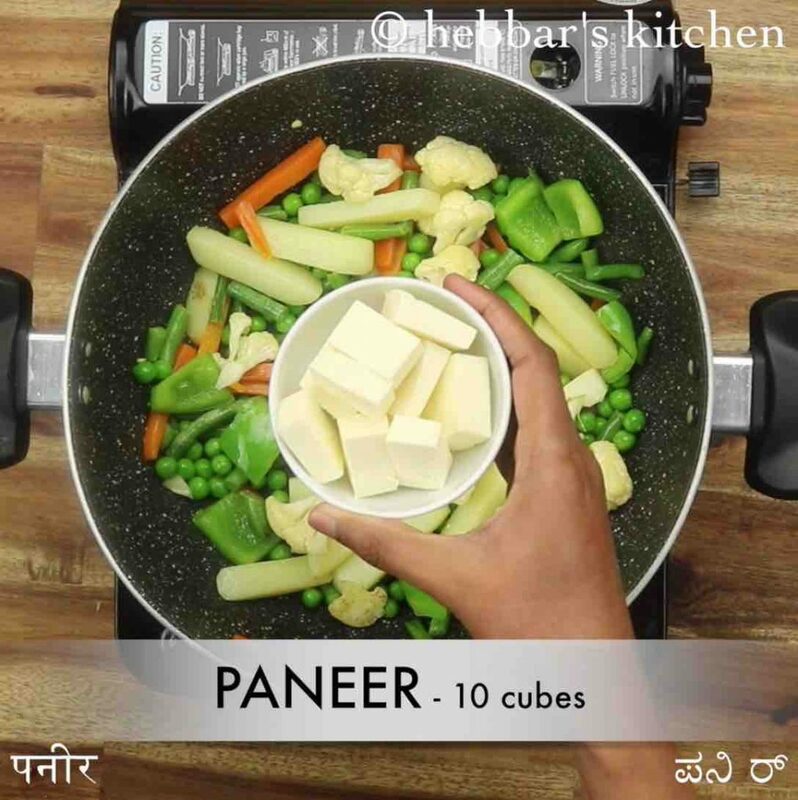 now add 10 cubes paneer and saute until golden brown. keep the cooked vegetables aside. 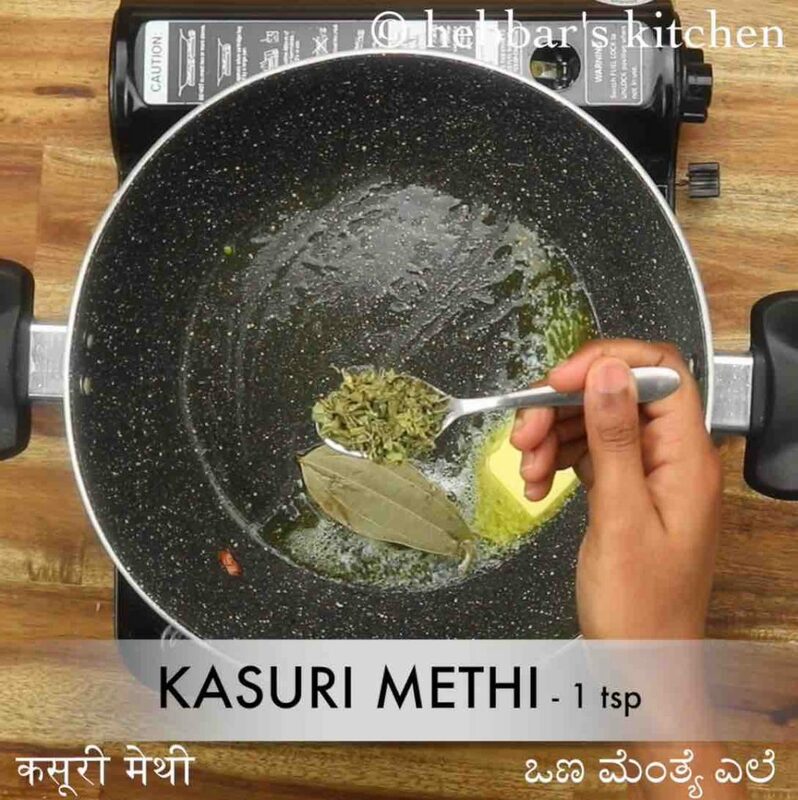 in the same kadai heat 1 tsp butter and saute 1 bay leaf, 1 tsp kasuri methi and 1 tsp cumin until the spices turn aromatic. now add 1 cup tomato puree and saute well. 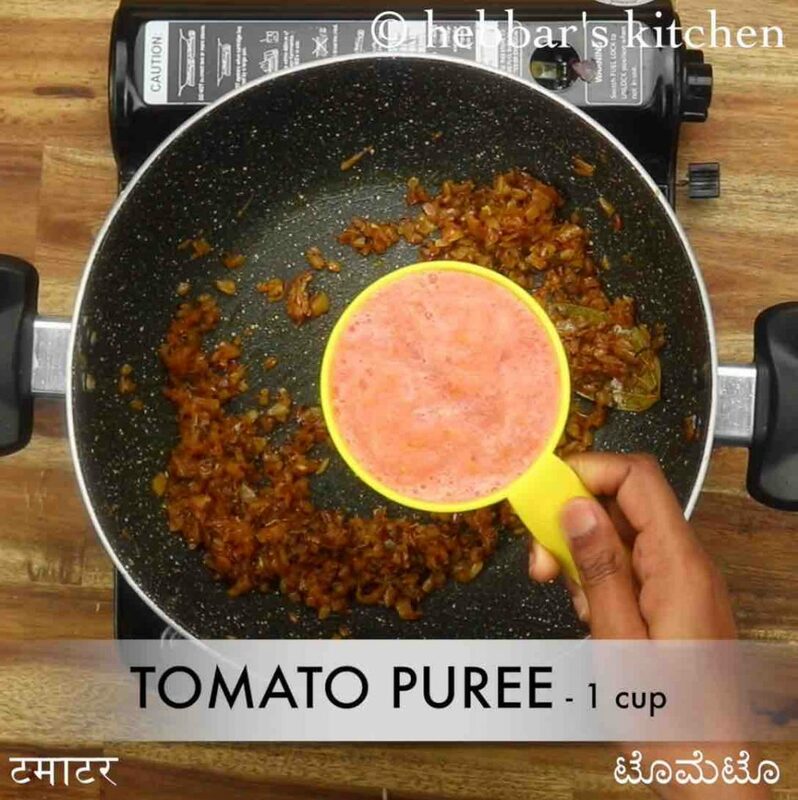 to prepare tomato puree, blend 3 raw tomatoes in a blender. 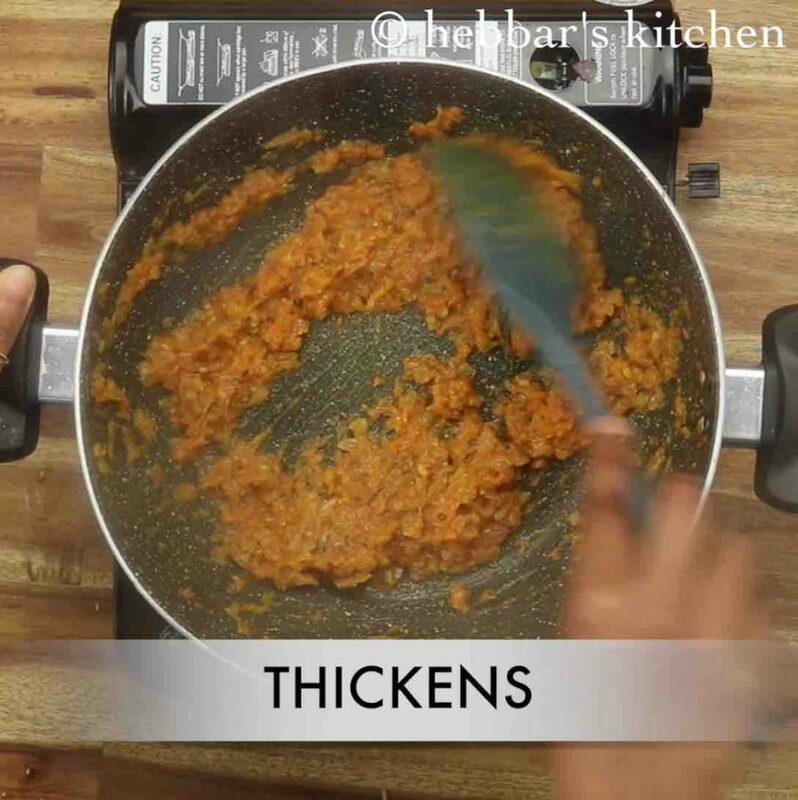 cook tomatoes until it thickens completely. now add prepared kadai masala and ½ tsp salt. 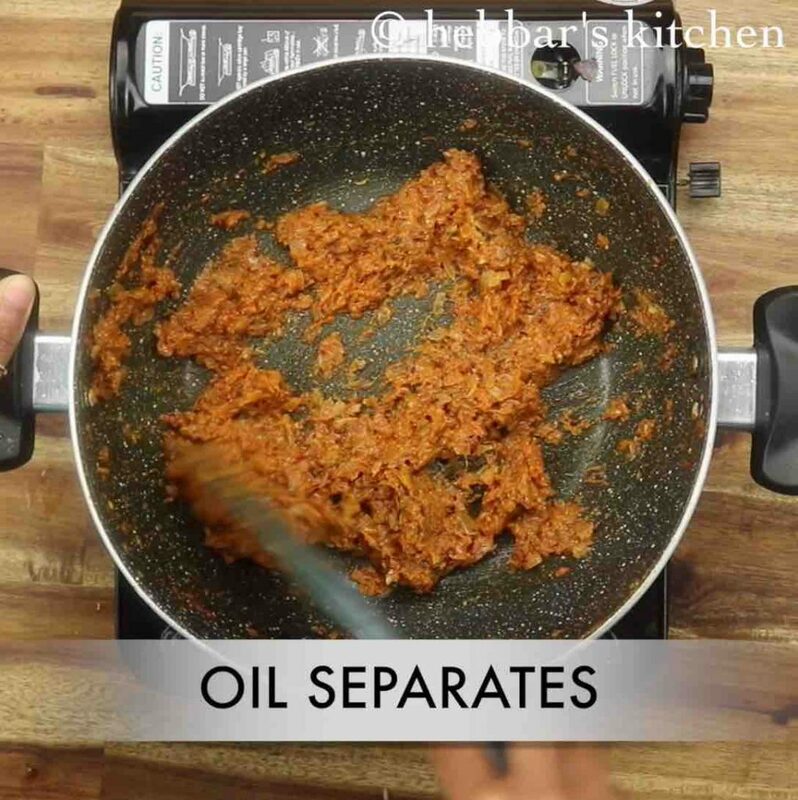 saute until the mixture releases oil. 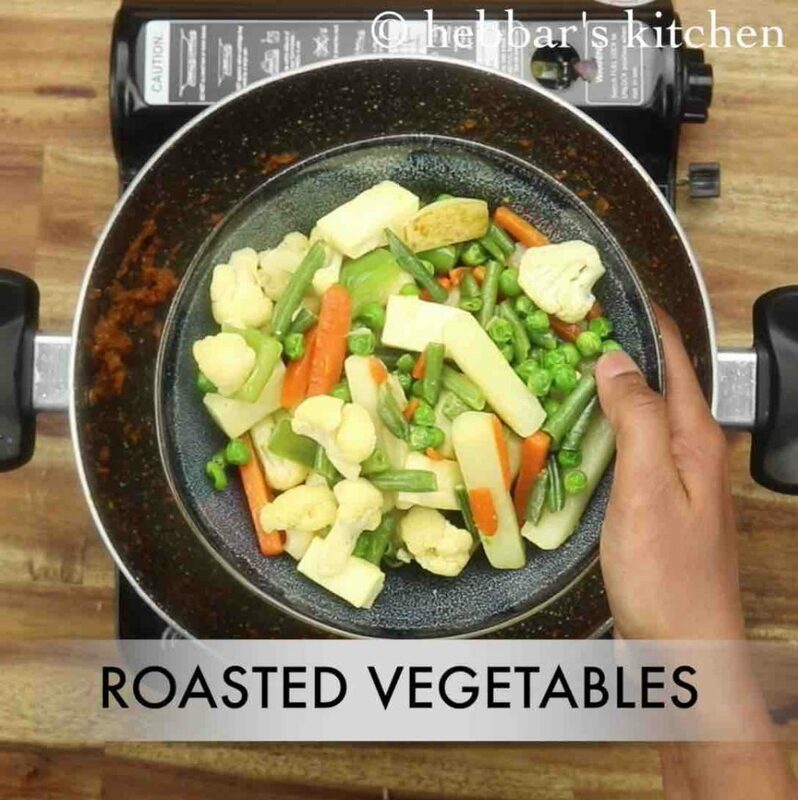 also, to avoid excess oil usage, you can boil the vegetables in water rather than roasting in oil. 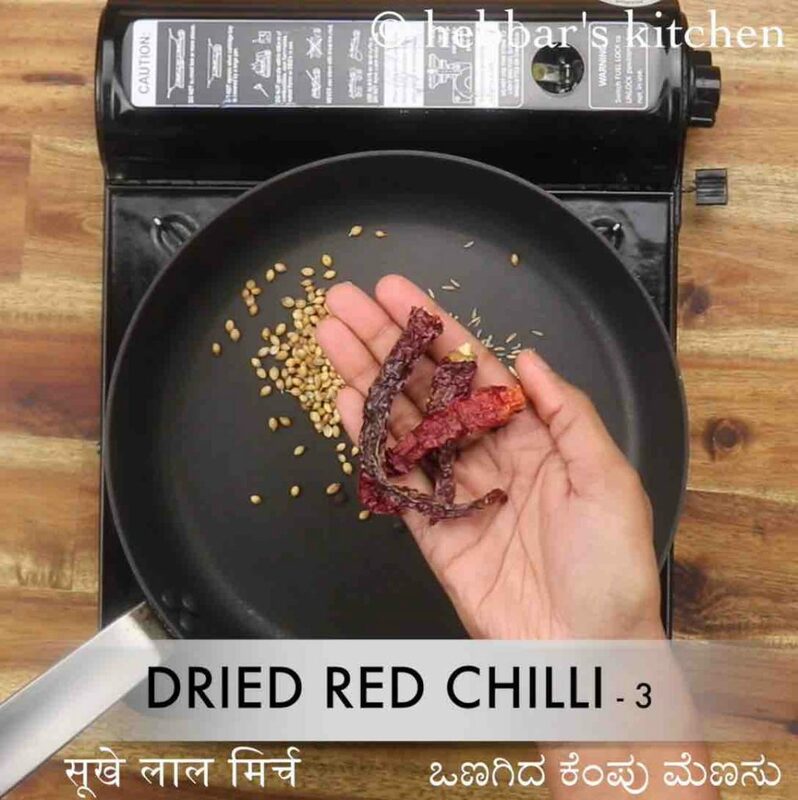 additionally, kadai masala can be prepared in large quantity and use as required. finally, veg kadai or kadai vegetable recipe tastes great when served slightly dry.